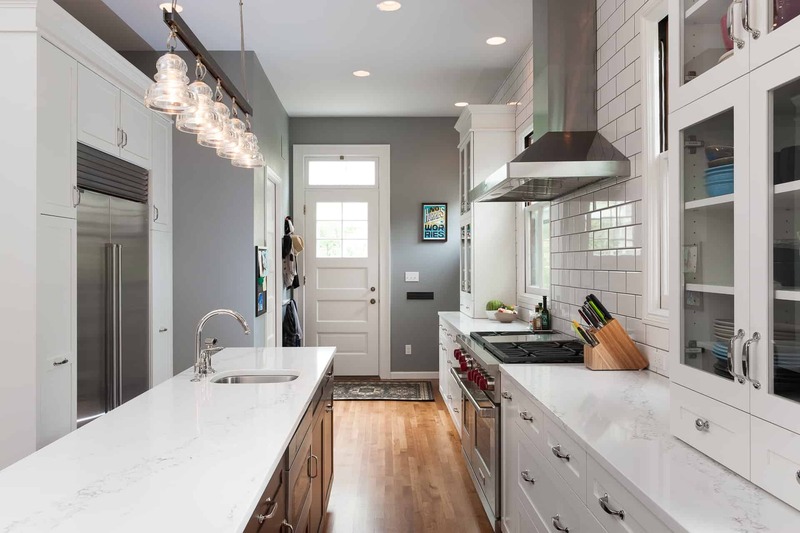 Above: Subway tile adorns the kitchen remodeling project in this historic home. Above: Thoughtful material selection gives this historic kitchen an authentic feel. The space was inspired by service kitchens and draws from a palette of craftsman and industrial components. Statuario polished quartz countertops, industrial glass lighting fixtures from Troy Lighting, polished nickel Rohl faucets and warm grey colors complement stainless steel Sub-Zero, Wolf and AsKo appliances. 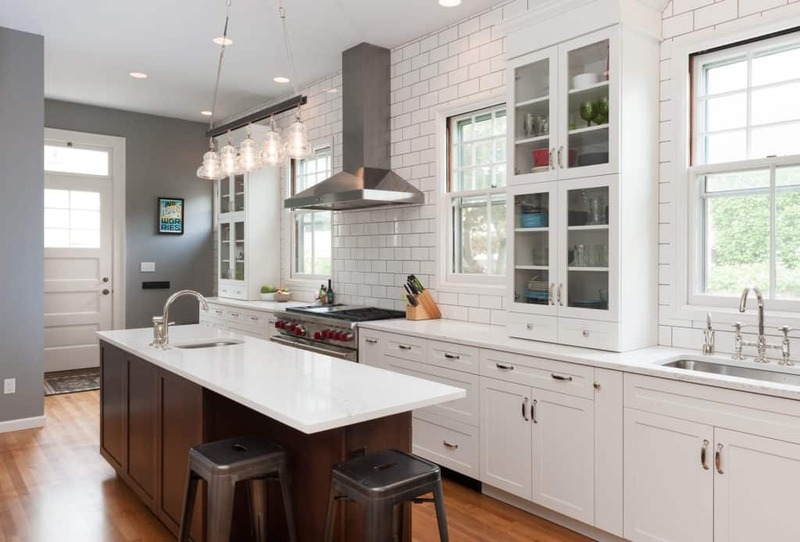 To brighten the space, Genovesi used a full wall of white subway tiles with a glossy finish and white Neil Kelly cabinets that reflect light from the windows. The home is under historic designation, so no exterior changes were made without consulting the local planning commission. Inside, an unused door to the living room was removed, a guest bathroom was removed to expand the pantry, and a new appliance configuration for the refrigerator, sink and range created ergonomic workstations. 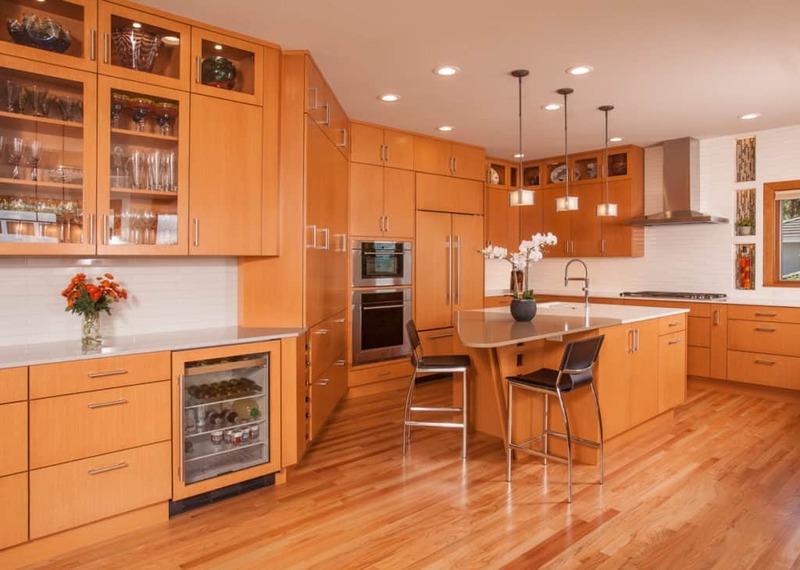 Above: Puget Sound kitchen featuring island with custom two-toned counter. Design consultant Diane Foreman’s goal for this kitchen was simple — increase the openness and sweeping views of the Puget Sound. In completing this goal, the space received additional storage options and functionality while integrating seamlessly with the great room. The project took a unique turn as the angles in the original layout of the kitchen were challenging to work with. Foreman solved these issues by installing an unusually shaped and beautifully fabricated island with a two tone countertop that highlights the workspace and eating areas. The Neil Kelly design-build remodel team also created a pet feeding area in the island, a charging station and communications area near the kitchen entrance, and a beverage center in the dining room’s built-in buffet. 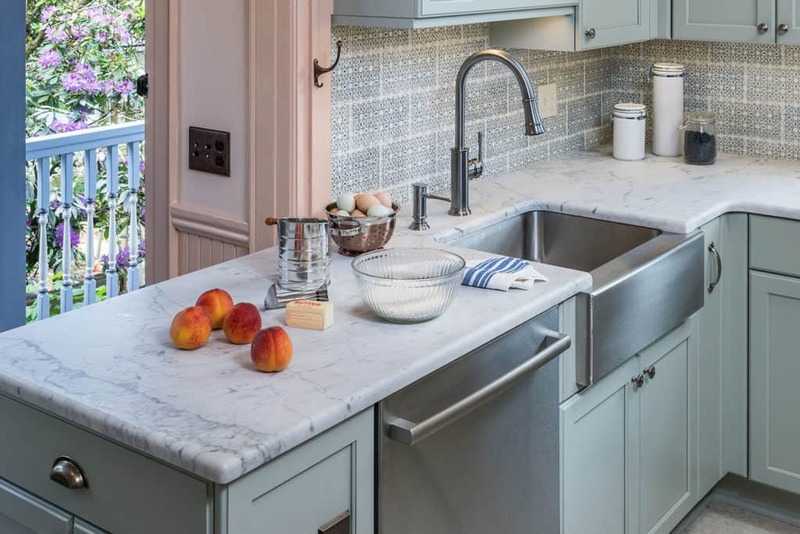 Design consultant Janel Campbell found color inspiration in a surprising place for this kitchen remodel in a 100-year-old home: chicken eggs. The homeowners had lived in the space for more than 40 years and needed to update features from the 1970s. The result? A Victorian farmhouse with lovely Carrara marble countertops, green cabinets, soft peachy walls, a faux tin ceiling and an ornate tile backsplash from Pratt and Larson Tile. The Neil Kelly team sourced local, sustainable and period-appropriate materials for this kitchen — an approach that was not without its challenges. The team worked hard to restore the original wainscot, trim molding and curved window casings while the project was under construction. As a result, the space effortlessly combines modern conveniences with timeless charm. Need help creating your dream kitchen? Our Design-Build Remodeling Team will help you transform your vision and existing space into a kitchen that is as functional as it is beautiful. Contact us today.